When I moved to Buenos Aires one year ago, the idea in the back of my mind was to get to know Argentina, but also the rest of South America. Being based in Argentina gives me a great opportunity to travel to the countries all around. At the beginning of this year, I realised that I hadn’t really travelled much in South America so far. As a matter of fact, I had travelled to many places in 2017, but not in South America apart from a couple places in Argentina. It was time to change that! One of the things I don’t like about Argentina is the price of flying. The high tax policies make it more expensive to travel from Buenos Aires than from other cities nearby. I really wanted to go to Colombia after hearing so many good things about it,but Colombia is not too close from Argentina and therefore quite expensive. I believe it’s cheaper to fly from Europe to Colombia than from Argentina to Colombia, how sad (for me)! I discovered that travelling from Chile to Colombia was much cheaper. Eureka, I had found a solution: I’d travel to Chile and then to Colombia. Chile was also high on my travel list, so this solution made a lot of sense to me. 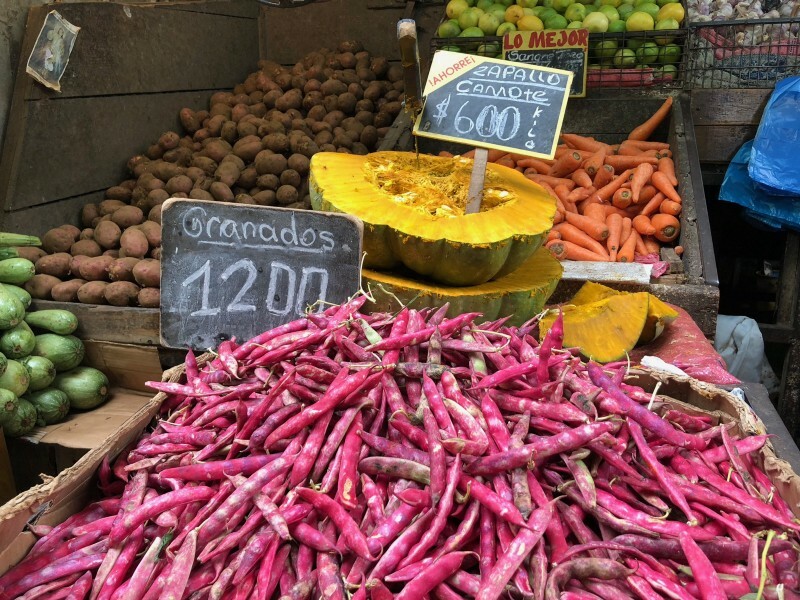 I will have to tell you more about Colombia but, first things first, here is a few words about my trip to Chile, with a focus on the city of Valparaiso my coup de coeur. I arrived in Santiago de Chile. I had planned to go to Valparaiso for almost a week and it was a great decision. I love big cities, but I also love to get away from them from time to time. Valparaiso is only an hour and a half away from the capitol Santiago; it’s a very easy commute, and so cheap! I was amazed by how nice and easy it was to get to this beautiful port. I wish there was a way to get to the ocean so easily from Buenos Aires! 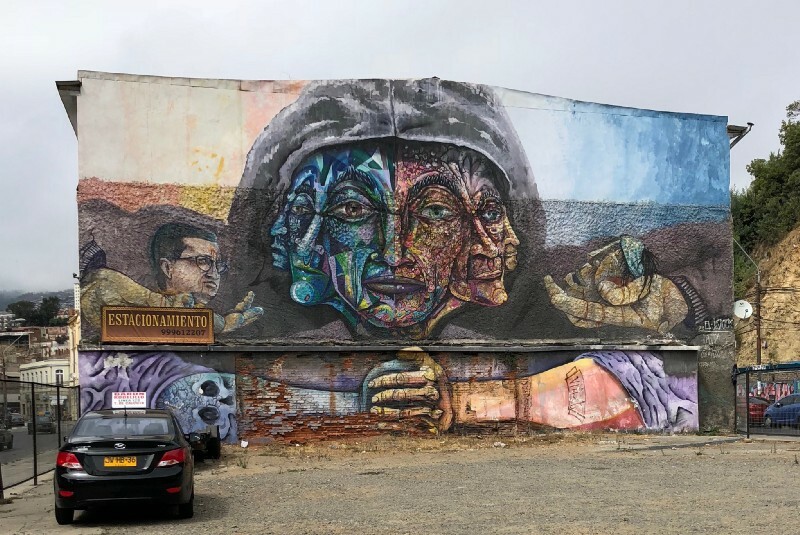 What’s great about Valpo (this is how locals refer to Valparaiso, I would have thought Valpa, but no), as well as the ocean views it has culture and history. I had the pleasure to go on a Street Art tour and I totally recommend it, understanding this art always gives a better idea of a place. Valparaiso is much more than just another touristy city. The port and the fishermen have made the city the way it is today and it is still a huge part of its economy. This is also visible in many graffiti pieces illustrating, for example, the opposition of many inhabitants to a controversial new fishing law. In 2012, this governmental decision provoked strong protests in Chile. 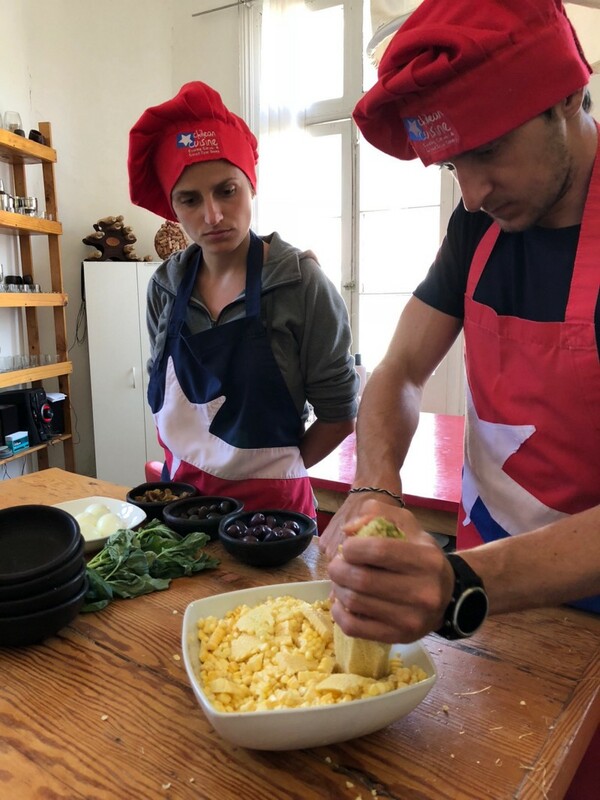 After some research about cooking opportunities in Valpo, I had the chance to meet Martin who created the Chilean Cuisine Cooking Class. The following day (my last day!) I participated in a cooking class with Ines. Martin comes from Australia and has been living in Chile for a long while now. Before Valparaiso became such a popular place to visit, Martin managed a hostel and he often listened to guests complain about the lack of possibilities to cook while in the city. 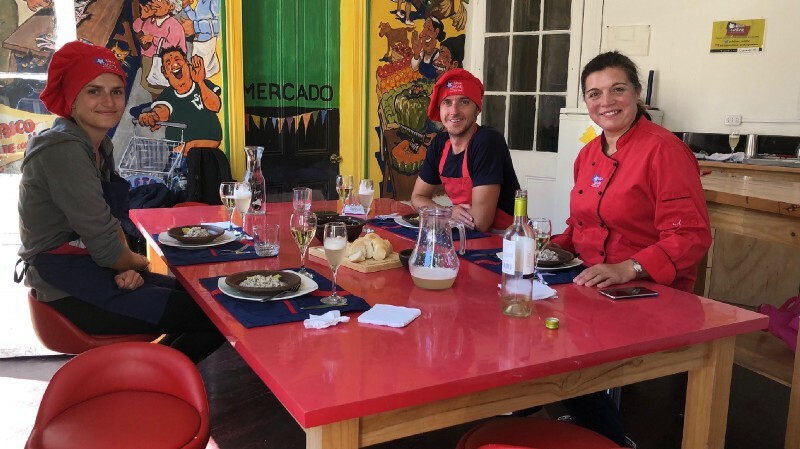 This is where the idea for the Chilean Cooking Class comes from! I can certainly identify with this story since I always look for cooking experiences while travelling, feels great to know I’m not the only one. On my last day, as planned, I met Ines in a café in the centre of the city where two other guests joined us, a French couple travelling the world together. We started by going to the main market to buy the ingredients, the best way to start a cooking class! 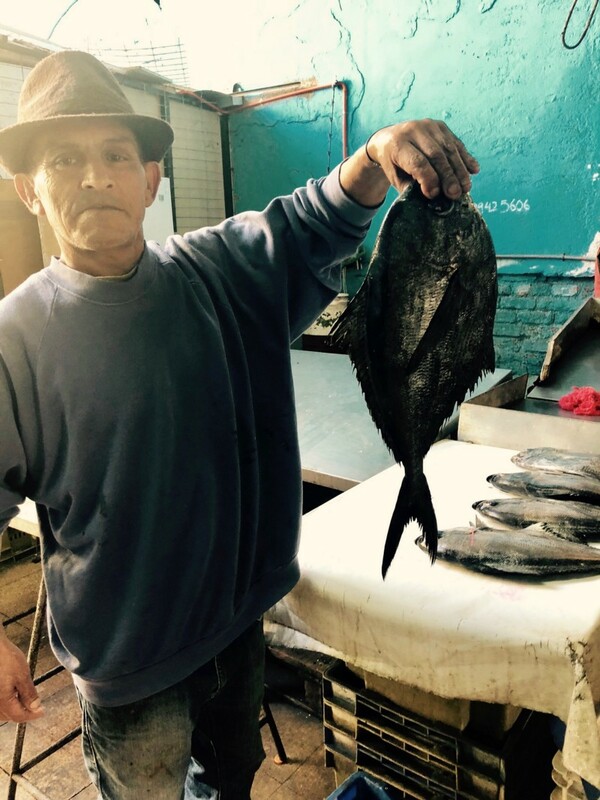 Since Valparaiso is a port and we were going to cook some Chilean ceviche, we went to buy some fresh fish, reineta specifically. Chile also produces delicious fruits and vegetables and it was a pleasure to hear Ines tell us more about them. The country has the advantage of being long, this means that it has different climates and you can find strawberries, lemon and more tropical fruits, very yummy! We then went straight to the kitchen and started cooking, beginning with the dessert: leche asada, which is a delicious flan. 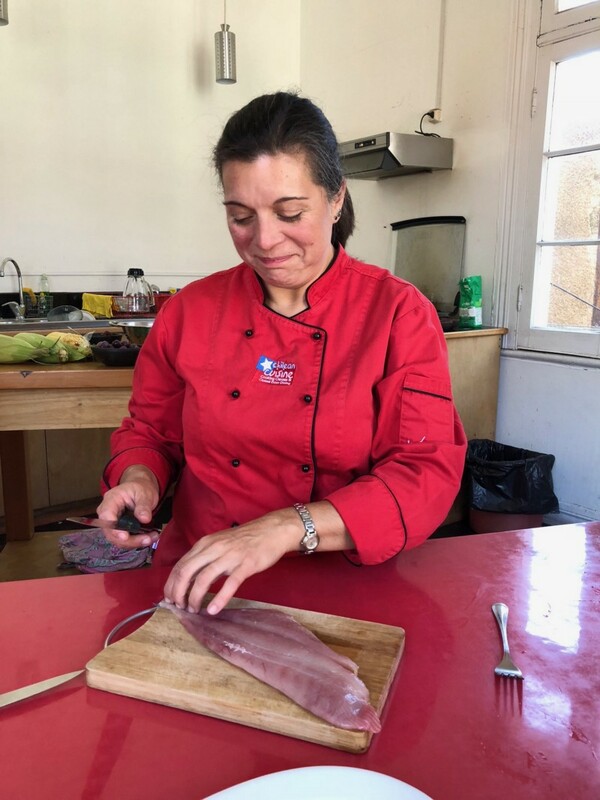 Next, we prepared the fish for the ceviche ,we mixed onions, tomatoes, olive oil, cilantro and chili which are the ingredients for the pebre, a condiment that basically goes with everything, very fresh and tasty. We then prepared the pastel de choclo, a sort of corn gratin that I was very excited about as I really like recipes with corn! I wasn’t disappointed with that one, it’s very creamy, not light but so good! Finally, we made some empanadas! Yes, it was quite a feast. 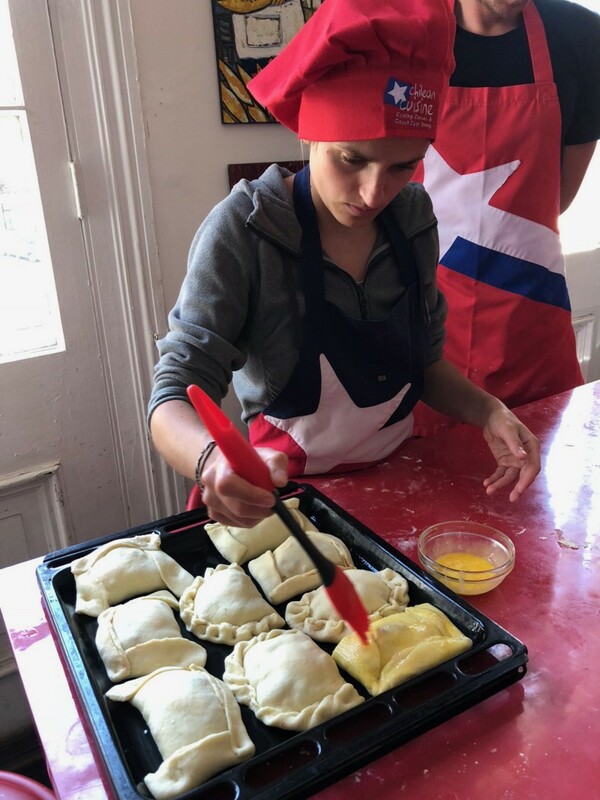 I had made empanadas in Argentina but in Chile, the recipe is a bit different. Ines’ recipe used wine instead of milk for the dough and the empanadas are bigger than the ones you usually see in Argentina. The food was quite amazing but we were not disappointed with the drinks either. While we were tasting the food, we had just made, we were drinking different Chilean wines, the famous Carmenière, a cépage almost exclusively produced in Chile. At the end of the feast, we also drank some delicious pisco sour, the typical cocktail made in Chile. 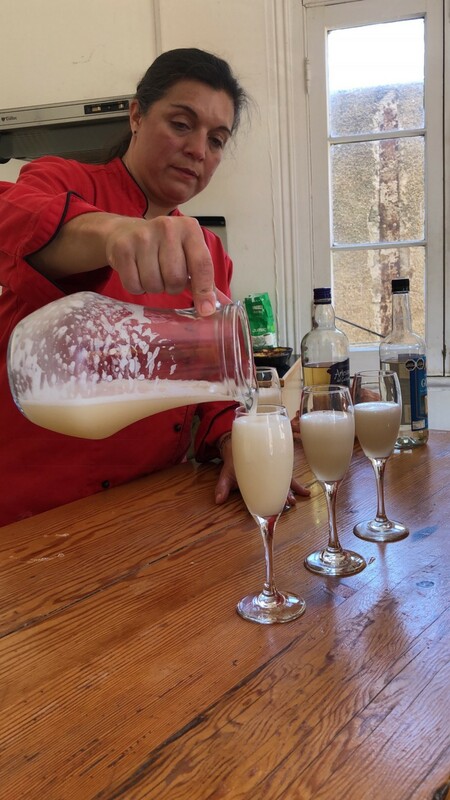 You could also drink Pisco in Peru. Very interesting to see that Chile and Peru compete in terms of Pisco and ceviche as well. I don’t want to take sides but I can tell you that this experience is worth it if you get the chance to visit beautiful Valpo. You can book for this experience in a few minutes on www.takemecooking.com. Did you enjoy this blog post? Subscribe to our newsletter to follow my adventures cooking around the world!